has outlined a new unit for measuring time that is able to subdivide individual frames at common framerates into a fixed, integral number of subdivisions. will introduce inaccuracies over time. 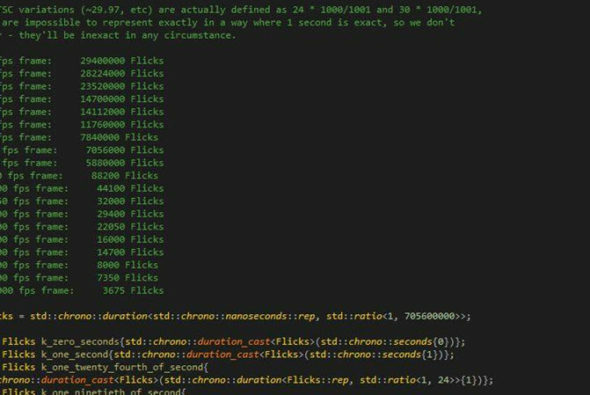 Flick though is an attempt to find the highest usable resolution of time that divides evenly into common film and media framerates. The OculusVR team’s research found that 1/705,600,000 of a second divides evenly into single frame durations for 24hz, 25hz, 30hz, 48hz, 50hz, 60hz, 90hz, 100hz, 120hz and also 1/1000 divisions of each. You can read more about this and download a C++ library on Github.